Because the world keeps getting more bizarre, it turns out that the best way to get these microbots to navigate around obstacles is to smear them with the bacteria that causes urinary tract infections and send them through an electrical grid. See a demonstration! In a recent issue of the journal IEEE Transactions on Robots, scientists from Drexel University described a way to get microbots to move around obstacles. It first involves smearing the little squares of photosensitive material with Serratia marcescens. This is the stuff that has gotten notorious for causing hospital patients to come down with nasty respiratory and urinary tract infections. The bacteria aren’t used for their flagella, although the tiny tentacles do help the bots stay afloat in the liquid substrate. The bacteria are primarily used for their charge. Smearing the bot with bacteria gives the entire structure a slightly negative charge. This charge makes it responsive to electric fields. Using two perpendicular electric fields, the scientists can push the robots up and down, or left and right, on a clear field. Moving around obstacles is tricky. 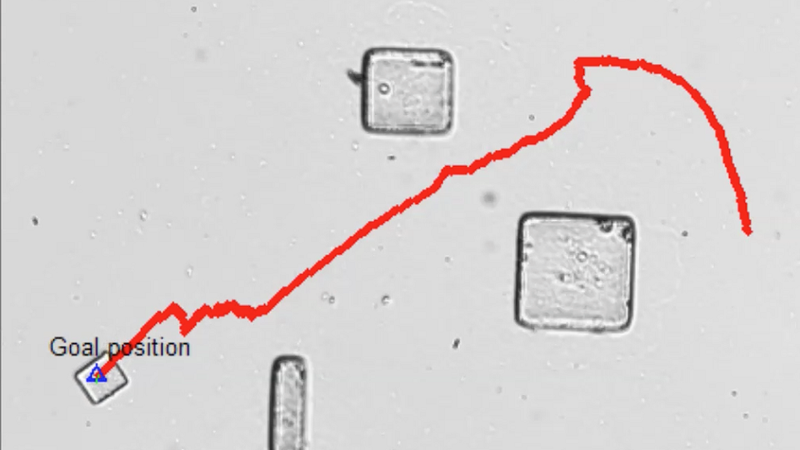 Although the bacteria might be carefully guided through an obstacle course by an observer, the goal was to make them able to bob and weave for themselves. Insulator objects, which don’t conduct electricity, deform the electric field around them. The microbots respond to that field by changing their course slightly. The scientists came up with a steering algorithm that takes that slight change of course into account, altering the robots’ course so it can move around the distorted fields, and so around the obstacles. We see here that it works pretty well. The researchers hope that this is the first step toward a whole fleet of different self-guided robots that can modify living cells in a culture or even in a body. Hopefully by the time that happens, we won’t have to worry about urinary tract infections anymore.